A few nights ago, my 6-year-old son Sam proudly showed me his “to-do list.” I was struck by the simplicity of it and reminded of the childlike faith Jesus tells us to have in Matthew 18:3. I told Sam how much I liked and agreed with his list and he asked if he could hang it up somewhere “so everyone in our family can see it and remember to do these things.” As a result of our conversation, his list currently hangs on our refrigerator and every time I see it I think about one of the core values of our church family: Love does. Thanks to the ultimate sacrifice Jesus made for us on the cross, we now can have a relationship with God. We are not required to “do” anything to secure our salvation. It is a free gift that we just accept. In other words, we aren’t saved by our good works. We are saved for them (see Ephesians 2:8-9, James 2:14-18). As believers, it is our job to show Christ’s love to everyone around us. We show that love to others by what we do. And the things that we do don’t have to be showy and extravagant. I think it would benefit all of us to add Sam’s to-do list to our own. Wouldn’t this world be a much nicer place if we all remembered to be kind and give hugs? Sunday, January 21 we’re singing these songs together. Let’s listen to them throughout the week as we prepare to hear more about how love does within the church. I love this post! It’s so true that Jesus saved us so we may do good works and spread His love to others! 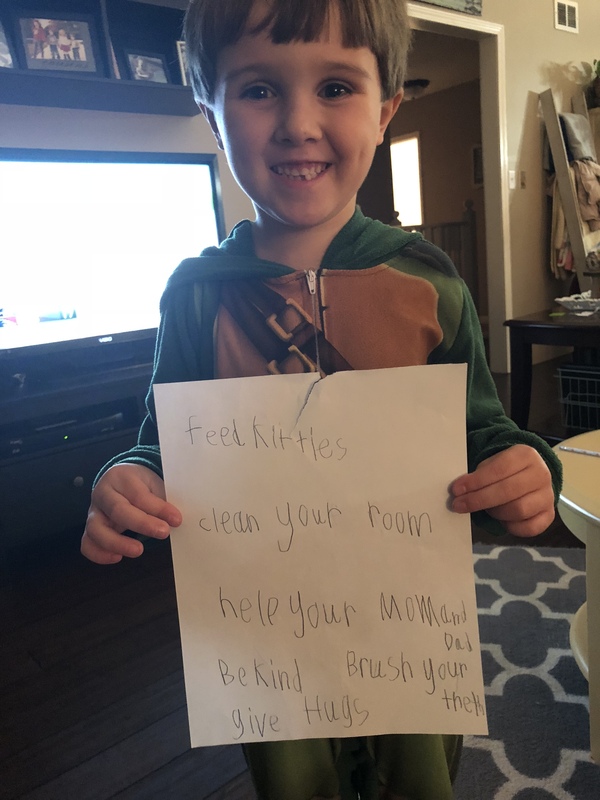 And I love how your little one recognizes that Being Kind, helping others and keeping his room clean should all be done daily (wink) Great read!